I once had a fellow design student ask me how to draw. We were gathered at a campus offsite from our own and were supposed to be sketching things around us. I described to her how I approached drawing; using the pencil as an extension of my eye, to move it over the paper as my eye moved over the object. It made perfect sense to me but I don’t think it helped her. Her drawing skills never improved over the 4 years. Don’t worry though, she graduated at the top of the class in the end. My point here is that we all have strengths and weaknesses. We can’t all be brain surgeons or jewellery makers or even interior designers ;-). I’d say Dutch-born Philip Sajet’s (BA Jewellery, Edelsmeden, 1981) was probably born with the ability to combine and contrast colour, form and perceived value in his beautiful jewellery. And as a collector of rusty old washers on roadsides I have to say he’s an inspiration! There was a time when I used to scour thrift stores for cool stuff. It was something I did to pass the time between elementary school drop offs and pickups. And I don’t know if I’m being nostalgic here but I think my finds in those days were pretty amazing; I still have an Indonesian hand-carved, 3 panel teak screen (in storage in the basement) and several cream coloured English earthenware bowls that I love (I have a thing about bowls). I used to find gorgeous picture frames and cool ornaments that I still have on display all these years later. Twenty five years on, if I go into a thrift store all I see is junk. 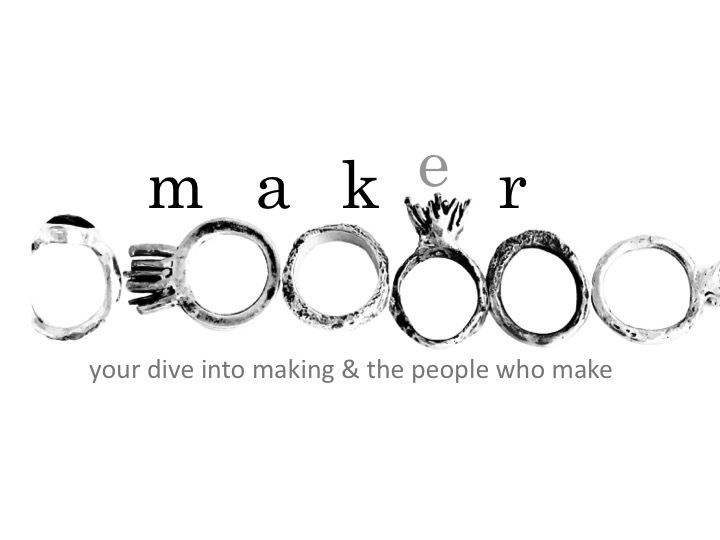 Maker Amber Cowen though sees potential. Cowen has been sculpting glass for 15 years. She has a BFA in 3D design and an MFA in glass/ceramics. She uses techniques like ‘flame working’ (sculpting glass by twirling thin rods of coloured glass over a gas-oxygen burner), blowing and hot-sculpting (hot glass shaped with blades, knives, shears and paddles). But the cool thing (pardon the pun) about her work is that she sources her material (usually American pressed glass) from thrift stores and flea markets and sometimes post production factory runs. So all those glass ornaments and jugs and dishes that I’d call useless are given new life in these outlandish yet beautiful sculptures. Who knew? I’m stepping beyond jewellery, ceramics, paper and even kittens in this post to venture into the world of Omer Arbel, creative director for Vancouver/Berlin based Bocci. Environmental scientist, architect, industrial designer and sculptor, Arbel was born in Israel and moved to Canada with his family at the age of 13. Israel’s loss, our gain. An immense curiosity and a willingness to experiment with the potential of his chosen material is what I find so interesting about this maker. It’s been said that Arbel and his creative team push boundaries by ‘designing a system that produces form rather than designing the form itself’ and that those systems lead to roughly 20% of their explorations resulting in commercially viable products (which may explain why Bocci lighting doesn’t come cheap and why each piece is a unique piece of art). Just imagine taking molten glass and shoving it into heat resistant ceramic fabric. This is how the stunning Bocci #73 came into being (see below). If you want to take a more immersive look into Arbel’s projects including and beyond Bocci I highly recommend checking out his office site here. I’m not generally a huge fan of glass as an art form, probably because I can’t get beyond imagining it tipping off a shelf and smashing into a million pieces on the floor. But I have to make an exception here. Lise Eggers studied glass blowing in Orrefors Glasskola in Sweden in 1988 and graduated from the Royal Danish Academy of Fine Arts for Architecture, Design and Conservation in 2005. Using kiln casting as opposed to glass blowing, she works with solid glass, sometimes shaping its molten form with her own hands. The colours, the translucency and the organic forms are beautiful. Yup, I like this glass.